Rogue and Gambit are one of Marvel's favorite tortured couples. Their relationship would be difficult enough without Rogue's power...but her uncontrollable absorption of the memories, powers, and "life force" of anyone she makes physical contact with makes any kind of "normal" relationship all but impossible. Still, the on-again, off-again couple has managed to endure through the years, pushing each other away, only to pull each other close again. Despite her powers, they actually kiss more than you might think...surprisingly without her absorbing him on several occasions. Below is a list of all the kisses I have access to (through owning the comics or seeing the cartoon...I will add kisses as I obtain more comics). I have placed them in three categories - Absorption, No Absorption, and "Almost" Kisses (where they lean forward and you think they're going to kiss...but they don't), and have listed them in the order in which they appear in the comics/cartoons. 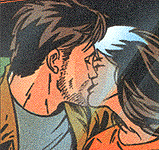 For more information on the issues/episodes in which these kisses appear, visit my Essential Rogue and Gambit section. Situation - The crystalline wave is about to hit, negating all existence, so Rogue and Gambit seize the moment to kiss for the first, and what they think will be the last, time. The wave hits shortly thereafter, and the entire world shatters into a thousand pieces. Result - Obviously everyone doesn't die (though I'm not sure how that worked out). Gambit is in a coma for three weeks, and Rogue wanders the U.S. with Iceman in tow, trying to make sense of the memories she's absorbed from Gambit...and feeling super guilty about almost killing him. Situation - "Erik the Red" has paid bounty hunters to capture Gambit...now that he has him, he puts Gambit on trial for his role in the Morlock Massacre. Rogue is called as a witness, and is forced to kiss him so she can absorb his memories and describe exactly what happened to the court. Even as she leans forward, she apologizes to Remy, who tells her that none of this is her fault. Result - She shares the memories she's absorbed (a mixed blessing if you ask me...because as much as it exposes his mistakes, we also learn that he tried to stop the Marauders when their intentions are revealed) with the court. But before any judgment can be passed, Rogue uses his powers to free him and the other X-Men...although she goes on to abandon him in the middle of Antarctica. Episode - "Dark Horizons: Part 1"
Situation - Under Mesmero's spell, Rogue goes around absorbing every mutant on the show...when it comes to Gambit, he holds her off for a minute or so, but she manages to catch him off guard and absorbs him with a kiss. Result - Gambit passes out. Rogue kinda smiles. Situation - Rogue and Gambit have begun telepathic therapy with the help of Emma Frost. During the session, Gambit tells her that they don't have to do anything...they could just hold hands if they want. Rogue says that she "wants to do everything," and confesses that she doesn't know what she'll do if this doesn't work. He cups her face in his hands and nothing happens, so he kisses her. Result - As they kiss, Rogue thinks back to the way the met, followed by their first attempt at a date, absorbing Remy all the while. When she realizes what's happening, she lets go, but it's too late - Gambit has been reduced to a dry skeleton. He lives, but they're both understandably upset about the incident. Situation - Rogue and Gambit are cooking gumbo and flirting...then Gambit dips Rogue and gives her a nice big kiss. Result - Um...the gumbo overflows and burns a little. Why no absorption? - It turns out that a villain named Gamesmaster wanted to do something nice for the X-Men by making all their dreams come true...but in order to do that, he had to trap Jean Grey in the astral plane. Joseph (a younger version of Magneto with amnesia) is the only one who remembers Jean and notices her absence. He convinces Rogue, and through her Gambit, that something is terribly wrong. They hunt down Gamesmaster and help free Jean. Result - Now that she doesn't absorb him, they kiss a lot. Why no absorption? - Apparently Gambit has "stretched" his mutant abilities...which means, amongst other things, that there is a perpetual biokinetic field surrounding him that counteracts her powers. Situation - In a battle with Lady Mastermind and Sebastian Shaw, Rogue has fallen under Lady Mastermind's spell...which begins with her in bed with Gambit. Although she isn't entirely convinced, I guess the part of her that wishes she could safely touch people gets the better of her. Result - Rogue is very happy for a very short period of time. Why no absorption? - It's all an illusion...she's not actually kissing anybody, so there's nothing to absorb. Situation - Still under Lady Mastermind's control, Rogue thinks that Bishop is Vargas, and is attacking him...when someone taps her on the shoulder. Rogue turns around to find another Vargas behind her. She begins to hit him as well, but elsewhere Lady Mastermind has been knocked out, and the illusion begins to shatter. 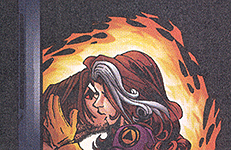 Rogue finds Gambit's face under the facade and smiles. When another character looks through the ruby lensed sunglasses that allow teammates to see what's happening to each other, we see several overlapping images of the X-Treme team, including Rogue and Gambit kissing. Result - Nothing. They kiss. Why no absorption? - Good question...an oversight by the writer/artist/editor? By all accounts, she should have absorbed him. Situation - The Shadow King has escaped from the prison Psylocke had trapped him in (because she's dead), and is now trying to use Rogue as his puppet. The first kiss begins in Rogue's mind as she kisses the Shadow King, but she opens her eyes to discover that she's kissing Gambit. The second kiss takes place entirely in her mind. Result - Rogue is surprised to find Gambit in front of her after the first kiss. Why no absorption? - Good question again. The first kiss should have resulted in some kind of absorption...unless the entire kiss (not only the beginning with the Shadow King) is in her imagination, and Gambit is just standing in front of her in the real world. The second kiss is a result of her imagination and nothing more, so there's no physical contact and nothing to absorb. Result - Eventually she convinces him to fight for his life, and they both survive the ordeal. Why no absorption? - This takes place on the astral plane, so technically there's no physical contact. Additionally, when Logan tries to make Rogue absorb him because he thinks she's going to die, we find out that she's lost her powers...so even if there was physical contact, she wouldn't have absorbed him. Situation - Gambit is depressed because he hasn't regained his powers, and he partially blames Rogue (since she dragged him back to his body). But when Rogue confronts him about their relationship, he steps up to the plate and agrees to take it day by day, to see if things go anywhere now that they can finally touch. They end the conversation with a kiss. Result - They decide to temporarily leave the X-Treme team in order to explore their relationship in privacy. Why no absorption? - She doesn't absorb him because she's lost her powers. Situation - Gambit Rogue are strolling on the beach in Valle Soleada, California. The sun is shining, the birds are singing, everything is perfect. Result - Rogue starts to sing "Wild Thing" to Gambit. Why no absorption? - Both Rogue and Gambit lost their powers in X-Treme X-Men #18. Situation - In Las Vegas, Rogue and Gambit are getting reading to break into some kind of high tech building. Result - They declare their love for each other before Gambit maneuvers his way through a series of webs of combat-strength lasers, and Rogue kicks down a big metal blast door. Situation - Rogue has been fatally stabbed by Sinister, who was disguised as Gambit. Sobbing, Gambit asks how he's supposed to tell their children that their mother is dead, how he's supposed to go on...Rogue encourages him to find the strength to do both, as the man she loves. Result - They share one last kiss before Rogue enters immortality. Why no absorption? - Other than the fact that I believe she has control over her powers in the future (see above), she's so weak I don't think her powers even work at this point. Situation - Gambit and Mystique have just saved Rogue, who has been held captive by the Hellfire Club. But when he leans over her, he discovers that she isn't breathing, so he performs mouth-to-mouth resuscitation her. Result - She starts breathing again, and she hugs him in gratitude. Why no absorption? - Rogue's powers are different in this alternate reality. She has the ability to communicate with the dead, rather than absorbing people. Result - Rogue screams at him because he know that if he touches her she'll absorb him and he'll end up in a coma...but he claims that he loves a challenge. This leads to their first attempted date. Result - Overcome by a combination of love and guilt (since she accidentally absorbed Belle's memories while watching over her), Rogue runs away. Situation - On their first successful date, Gambit takes Rogue out to dinner, and then on a romantic carriage ride through Central Park. He asks Rogue to trust him and tries to kiss her...but she pulls away, admitting that she's afraid of unintentionally putting him in a coma. Result - He tells her that they'll just have to find another way to express their feelings for each other. Situation - Gambit has somehow made his way out of Antarctica (see Uncanny X-Men #350), and this is the first time he's seen Rogue. After being attacked by a crazy woman named Kali who hears voices that have been telling her to kill them, Rogue tries to pick up the conversation where they left off (before Kali showed up)...they lean towards each other to kiss, but don't go through with it. Result - Rogue apologizes for pushing Gambit too hard too fast...but warns that she'll only wait so long for him to make a decision about their relationship. Situation - They're about to go into space to battle thousands of Golgotha creatures. In a previous issue, Gambit said some nasty things to Rogue about their relationship and Rogue kissed Wolverine (under Golgotha's influence), so this is their chance to put it behind them before they go on a mission (and possibly die). Result - They kiss and make up the only way they're able to...through a barrier. *Note - I have scanned all images appearing on this page, except for X-Men: Evolution images, which I obtained from Beyond Evolution. If you wish to use any of my images, please ask first.